Anarkali suits always remain in fashion. They have that unique charm and grandeur which make them a perfect dress to turn to during festivals, marriage and other special occasions. They come in different patterns and styles. 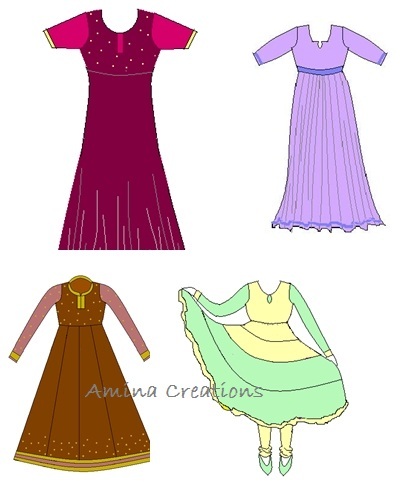 In this post I am going to share a few tutorials on stitching different patterns of anarkali dresses. Click on the links to read the tutorials. This is the basic type of anarkali suit with fabric pleated at the waist. This type of anarkali has the lower part stitched together using layers of fabric of the same or different colour. This type of anarkali suit has a full flare umbrella cut and hence does not have pleats at the waist. In this type of anarkali suit, mono colour or multicolour panels are stitched just below the waist. This pattern of anarkali suit is ideal for people who are on the fatter side as it has half the normal flare of a full umbrella cut Anarkali suit. Anarkali suits are always worn with gathering pants/ churidhar. A tutorial on how to stitch a churidhar can be found here. Thanks for the post. Can you also please share a post on altering anarkali suits? I have an anarkali suit which is very long and large.